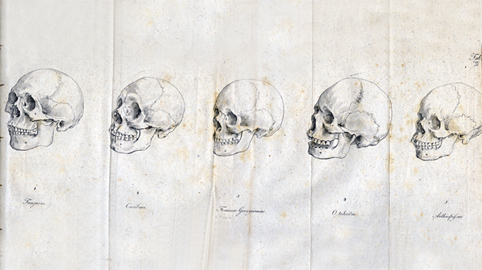 Until Darwin: Science and the Origins of Race: Why this work and this site? Why this blog? It is intended to be first and foremost a companion to the book Until Darwin: Science, Human Variety and the Origins of Race (London: Pickering and Chatto, 2010). The purpose of this blog is to occasionally post comments or sections that did not make it into the published version and to provide references to sources consulted but not mentioned in the text. You will also find links to images that could not be included in the book or are simply related to the topics discussed in the book. This best way to explain this is to reproduce a brief conference paper I did in 2000 at the American Sociological Association annual meeting. It provides a good description of my thoughts as I finished the initial research for Until Darwin, and points to further work. The companion to Until Darwin will be a work on the central role of the scientific ideology of degeneracy in the formation of sociology over the period between 1770 and 1914. The working title is Homo Socius. In some respects, Until Darwin is meant as the background work to that project, while the projected work on degeneracy and the origins of sociology will continue the examination begin with Until Darwin. So below is a draft of the description of the general project presented as a conference paper. Of course, some of my thinking has changed since then, but overall my perspective has remained the same. The relationship between sociology and Social Darwinism is often assumed but it is not very well understood. Many simply passed it off as a forgotten dead end. It was Parsons who said that “no one reads Spencer anymore”. And it is Parsons who explains this forgetting of Spencer as an evolutionary triumph of sociology. Sociology did not emerge from Social Darwinism. Sociology and Social Darwinism share common origins in Spencer, political economy, discourses on government, and scientific disputes, especially the species question and the question that consumed American biology in the 19th century: monogenesis versus polygenesis. Given this range of origins, I was lead to question the notion of social Darwinism as it relates to Darwin’s intervention into the monogenesis/polygenesis debate. This debate is essential to understanding the scientific ideology of race. Race was the central problem in the American approach to the species question. Slavery was a driving force behind the debate between the mongenists and the polygenists, but the debate over the origins of humans and the classification of their diversity had been well underway in its modern form since the 18th century (which owed earlier descriptions and representations of the Plinian Races). It was not the Civil War that ended the monogenesis/polygenesis debate (as Stanton says in his The Leopard’s Spots, which remains one of the best works on the subject), but Darwin. Only the species question was to later reemerge from its repression with the work of Lombroso and Weissmann. It is often stated that Darwin broke with Lamarck and Natural History, but the Origin of Species ----modification by descent vs. creation vs. successive creation----was the question of Darwin’s time, and Lamarckism was not the subject of polemics from the pro-evolution side. Darwin to some degree followed Lamarck, most notably in Darwin’s theory of pangenesis. You might in fact read Darwin’s Origins as an anti-slavery argument. He was opposed to slavery. (Admiral Fitzroy, an originator of modern meteorological instruments and Captain of the Beagle was a vocal proponent of slavery and the superiority of the European. Darwin, who was hired on not the official naturalist, but rather the dinner and social companion of the Captain, noted in letter to his sister how unbearable it was to be endure these social gatherings with the Captain. The biology appropriated by sociology was not Darwinism, although it shares certain terminology and concerns. The discursive formation of sociology and biology was concerned with continuity: progress and degeneration. Darwinism, on the other hand, is concerned with discontinuity: species, extinction, isolation, and selection. This makes me look at sociology in a new way. Instead of seeing the period before the crisis in Western Sociology as having been one where bad sociology appropriated bad science, I began to see it as a bio-social discourse more or less autonomous from the discourse of Darwinism. This lead me to return to the history of sociology and of race from a different perspective. Darwin’s was an anti-slavery argument that destroyed the scientific and religious discourses on race. But the history of race appears in the context of a general assumption of bio-social progress and degeneration. It is degeneracy and not natural selection that supported Eugenics, and the linkage between the two sciences of society are profound. In particular, I want to focus on degeneration as it appears in sociology because it has not yet had a thorough treatment . If you understand how these work, then you can begin to understand the relation between the scientific discourses on race, the sociological ones (sociology in the broadest sense, as the definition of sociology narrows over time in proportion to the need to clean up its pantheon of fallen gods like Sumner, Spencer, Comte, Giddings, Cooley, Sorokin, Lombroso, etc. Feagin in his Presidential Address last night did exactly this, but of course it was only for the best of reasons, as his goal was to remember forgotten sociologists of the left) and together with the media’s re-presentation, we can discern more clearly how the history of this social relation weighs like a nightmare on the mind of the living today. Before you can discuss race, you must first discuss science, for race does not precede science, rather, science first establishes race --- at least race as we understand it today. By implication, this raise all sorts of questions for Marxist theory that claims science as its authority. Perhaps this is why the race question (and the woman question too) were deferred for so long by the Parties. It is not that addressing them would have distracted us from our critique of a more fundamental problems, as was so often claimed, but because addressing them would have called into question the scientific authority on which orthodox marxism rests.